For the GMV spotter, the easist way to identify a Sports Sedan is by the Interior Trim code on the driver's door. All Sport Sedan trim codes begin with a "P". 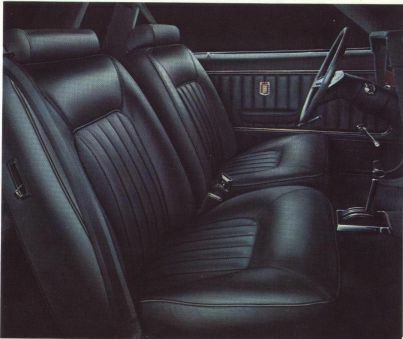 Aside from the trim code, Sports Sedans have unmistakable woven inserts in the seats and door panels unlike all other 1976 models. Sports Sedan - That's a Granada with new styling flair as unique as a classic dares to be. Which sums up the striking new beauty this sports option offers. Heavy-duty suspension, heavy-duty front/rear springs, shock absorbers, front stabilizer bar. The 200 CID six and 3-speed manual are standard. A 250 six, 302 or 351 2V V-8 and SelectShift are available. So far, only 1 1976 Ford Granada Sports Sedan has been identified (6W82L182824). More information regarding this Granada can be found on the 1976 Granada Registry Page.